The much anticipated, long overdue match-up between Floyd Mayweather Jr. and Manny Pacquiao has featured multiple narratives during the course of its build-up, and has been explored from virtually every conceivable angle. But one recurring theme that stands out more than most is the idea that this is the fight that truly cements the legacy of two fighters. In the eyes of many observers, the victor will have established himself as not only the best fighter of his generation, but will have ascended to the pantheon of greatness occupied by only a few select individuals. On the other hand a defeat, depending on its nature, could harm the other fighter’s legacy beyond any hope of repair. I’m really not so certain that’s the case at all. In the case of Manny Pacquiao, that certainly isn’t the case. Win or lose, he will still be the same fighter who marched through divisions that ranged from flyweight to welterweight, using a formidable blend of aggression and athleticism to overwhelm one high-quality opponent after another. If he loses, he’ll still be the same guy who won lineal world championships in four different weight classes, and portions of the championship in several more. Even if he’s defeated, he’ll still be this generation’s incarnation of Jimmy McLarnin; and given the latter’s status as one of the sport’s true greats, that’s high praise indeed. 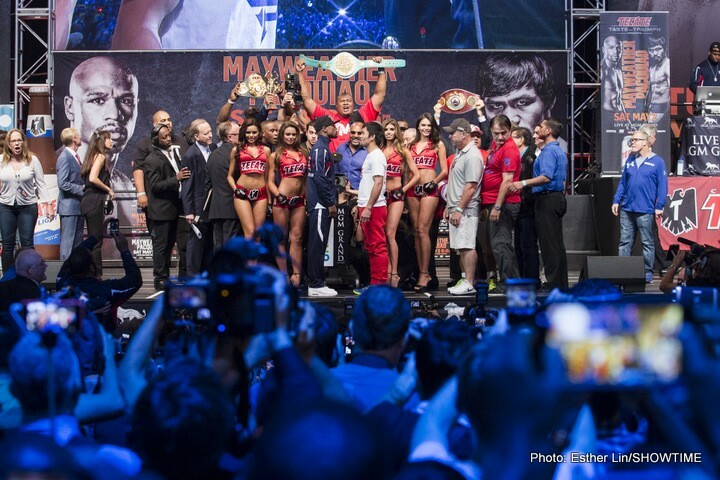 Of course, a win would enhance Pacquiao’s legacy- but not quite as much as one might believe. It wouldn’t necessarily erase the violent knock-out suffered at the hands of arch-nemesis Juan Manuel Marquez from our memory banks. The image of Pacquiao’s involuntary face-plant isn’t something that’s easily forgotten. A win over Mayweather, no matter how impressive, also wouldn’t alter the fact that many observers (including myself) felt that Marquez should have been awarded the decision over the Filipino super-star on at least one of the three other occasions that they stepped inside the ring. Manny’s a truly great fighter with a brilliant and dynamic offence, but he’s never been completely unbeatable. He’s looked close to unbeatable of a few occasions, against Barrera the first time around and again when he nearly decapitated Hatton. But, there’s always been the sense that someone with enough talent, technique and determination could always be capable of taking his measure. Even if he were to defeat Mayweather, that impression of him would still linger in the minds of many observers. He would continue to be one of the very greatest fighters to have stepped inside the squared circle. And, it would still be possible for a really special fighter to defeat him. That was true before the fight was signed, and it will remain true once the fight is over and done with. Floyd Mayweather’s situation is little different from his opponent’s; and that’s due to the fact that many believe that his legacy as a fighter, champion, and legend hinges entirely upon the outcome of this bout. Among his detractors, there’s been a sense that Mayweather has studiously avoided facing fighters who have presented a clear and present threat to his undefeated record; or somehow applied restrictions or otherwise manoeuvred them into situations which might limit their effectiveness against him. In their mind, his claim of being “The Best Ever” carries no weight; and several of his most notable wins should have an asterisk attached to them. To be fair, there probably is some truth to these claims. Mayweather missed out on the chance to fight fellow titleholders like Joel Casamayor and Acelino Freitas when he was campaigning at junior lightweight. He didn’t seem terribly interested in fighting Paul “The Punisher” Williams when the latter was still active and making a name for himself as a welterweight. There are some other names missing on his resume, like Kostya Tszyu, Erislandy Lara, Sergio Martinez or the late Vernon Forrest. These are all names that would have looked good on Mayweather’s resume; and victories over any of them would have made any attempt to criticize his accomplishments that much more difficult. And, it should be noted that a handful of Floyd’s wins have been controversial, for one reason or another. A lot of people thought Mayweather Jr. was fortunate to get the decision against the redoubtable Jose Luis Castillo in their first fight. While I personally scored the fight 114-112 in favour of Mayweather, there were a number of closely contested rounds; and a similar score in favour of Castillo wouldn’t have been at all unreasonable. There were similar complaints about the scoring of Mayweather’s first fight against Marcos Rene Maidana, and in his fight with Oscar de la Hoya, as well. Again, I scored both fights for Mayweather, but it can’t be denied that his opponents enjoyed some degree of success against him for extended periods in those contests. Even a couple of Floyd’s more decisive victories haven’t been free of controversy. His most recent knock-out, against Victor Ortiz, came as a result of a combination thrown during Ortiz’s continued apology for butting the welterweight champion, after the official had signalled for the action to resume. And one of Floyd’s best performances, a virtual shut out of Marquez, occurred after he missed making the contracted weight of 144lbs, against a smaller fighter fighting at welterweight for the first time in his career. That being said, I still think it’s unfair to say that Mayweather’s legacy lies solely upon this fight. Win or lose, he’ll still be the fighter who, like Pacquiao, has won lineal championships in four different weight classes. He’ll still be the architect of an undefeated streak that has extended for almost two decades against a consistently high liberal of opponent. Even if he loses today, he’ll still be remembered as one of the very best 130lb champions the history of a division that has featured the likes of Julio Cesar Chavez and Alexis Arguello. He’ll still have gone on to become a dominant player at welterweight, reigning twice over one of boxing’s deepest and most glamorous divisions. Nothing that happens tonight is going to change that. If Manny Pacquiao gets knocked out in the first round, he’ll still be considered one of the best and most dynamic offensive fighters of his generation. Likewise, if Floyd Mayweather were to somehow get starched in a manner of moments, he would still be remembered as one of the most technically proficient and defensively sound boxers in the history of the sport. So, for me, tonight’s fight isn’t about determining which is these two fighters is greater, because in their own way they have both proved to be great beyond any shadow of a doubt. Instead, it simply determines which of the two is better, at least at this point in time. In my mind, I think Floyd Mayweather is more likely to emerge as the correct answer to that question once all is said and done, for the simple reason that he’s better in more areas than his opponent. He’s the better ring general, and does a better job of dictating the range and tempo of his fights. He’s superior at long range, and makes better use of the jab to keep foes at bay and to prevent them from mounting a consistent assault against him. He might not land it consistently against his southpaw opponent, but he can certainly use it to set up openings for the right hand that follows. Even if Pacquiao works his way into a more desirable range to launch his attack, he’s still faced with the challenge of fighting someone who happens to be better at working in close quarters than he is. Floyd’s mastered the art of controlling them in the trenches, and then popping them with a quick punch or two before they can extricate themselves from his clutches and reset their position. That means that Manny’s task is to get close enough to Mayweather to launch his attacks, and then immediately slide out of range before his opponent can counter, or draw him in close in order to control him. That’s something that’s easier said than done. Still, Manny Pacquiao possesses some advantages of his own in this match-up. He’s faster of hand and foot than his opponent and probably possesses more punching power than his undefeated rival. He’s generally better at fighting at mid-range, utilizing underrated head movement to feint his opponent into position, and to avoid any counters that might come his way. If he stays disciplined, and follows the game plan of Freddie Roach, it’s very possible that he could find a way to keep thing at his desired range, firing two and three punches before skipping away from return fire. This strategy might well be the best way for Pacquiao to win rounds against Mayweather. Indeed, it’s probably the only way for him to win this fight. But, tonight, he’s going up against an opponent who isn’t that much slower than he is, who possesses superior timing and defensive ability, and who hits a little harder than most observers might think. That means Floyd will eventually begin to have success finding his foe with his laser-like lead right hand, or with his vaunted check hook; and when that happens, he’ll begin to connect with punches that Manny won’t be able to avoid, or ignore. Those blows might not hurt Pacquiao, but they affect him enough that he’ll forget the game plan and allow his fighting instinct to take over. He’ll lunge at his opponent with the intent of returning fire, and he’ll get countered for his trouble. I think that’s the moment that Floyd will use as the foundation for his plan of attack. And, as he gets his timing down and begins to connect with more and more frequency, he’ll build upon that foundation and create, if not a work of art, then something that’s still impressive to behold. Of course, winning in this fashion doesn’t automatically ensure that Floyd Mayweather will be regarded as being greater than Manny Pacquiao. Pacquiao will continue to be beloved in his native Philippines and around the world, while Mayweather will continue to have his fair share of detractors. Tonight’s outcome isn’t going to change that. And that, for me, is reason enough to watch. Previous boxing news: Mayweather v Pacquiao: Keys to Victory, Four to Explore, Official Prediction!